Here’s a tasty and quick dinner idea from “I Heart Naptime”. Everyone here loved it although next time I’ll be sure to get tortilla chips to serve with it. 1 In large skillet, heat olive oil over medium heat. Saute pepper and onion. Add hamburger and cook until browned. 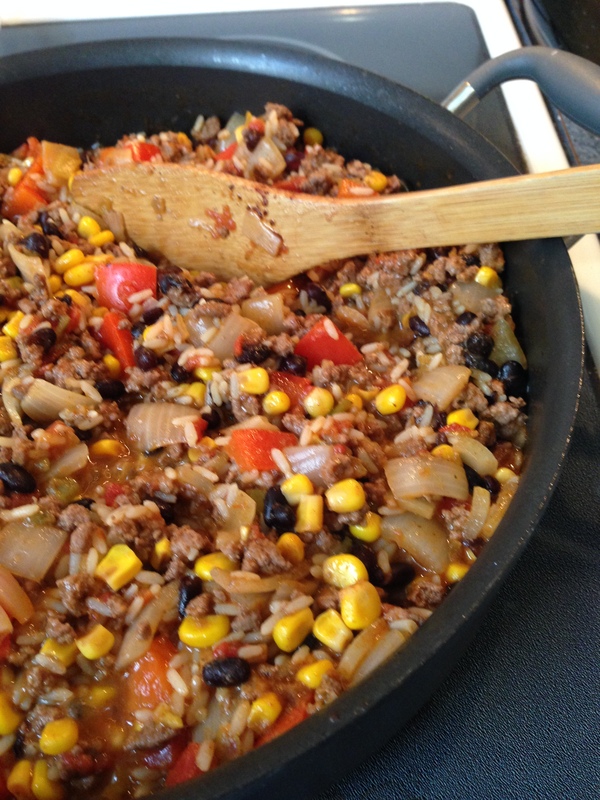 Stir in salsa, beans, corn, tomatoes, green chiles, rice, taco seasoning and chili powder. Pour in chicken stock and bring to a light boil. Cover pan and reduce heat to low. Cook for 15 – 20 minutes or until rice is cooked. 2 When rice is done, salt and pepper to taste and top with cheese. Top with favorite toppings.